I found something fantastic when I was planning on just spending a few minutes on Twitter. It was the community Matt and Kim had created. They had a post that said, “More postcards came in. The pinata one is priceless. See them on mattandkimmusic.com.” So naturally, I swooned over. It turned out to be a fan project where the heads of Matt and Kim were placed on top of a white postcard and people could draw or collage around them. It was awesome– these people had taken the time to color in and draw on a postcard and send it over to these musicians. Funnily, there was more than one involving a baseball bat and a load of candy. Though, if you scroll down past the postcards, there are a few videos. The first being a tap dancing video to “Daylight.” It’s a little hard to watch because after about 30 seconds into the song, the tap dancing overpowers the song and it doesn’t really work together anymore. But it’s so nice to see the teamwork that’s present- both Matt and Kim and these tap dancers are using this music to get through and enjoy their day. 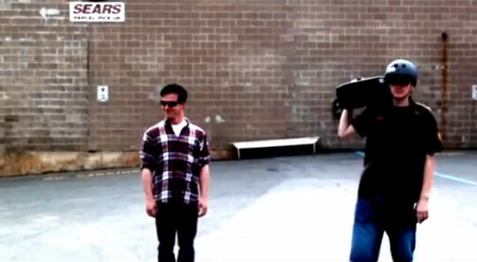 The next video was a music video set to “Cutdown.” You have no idea what to expect since at first it’s just a young guy to the right armed with a boom-box and a black bicycle helmet, and another to the left in a plaid shirt and dark sunglasses. They’re standing there until the music starts and the boy in the plaid shirt begins to bob his head and then rotate his hands and forearms like– I’ve never seen before. Maybe you haven’t either, but they start walking towards the camera and more kids join in until it’s this group of about eight, dancing together. The boy in the plaid looked like Ferris Bueller singing, “Danke Schoen” in the parade. He was the ringleader with blind confidence. It made me laugh and tear up because this is how they chose to spend their day; in the back of a Sears department store, together.